Tetraethylenepentamine « Global Market Insights, Inc.
With expanding global demand for various pharmaceutical, agrochemical, personal care, additives and chelating agents, the ethyleneamines market is expected to witness exponential growth opportunities over 2018-2024. This can be essentilayy credited to the fact that ethyleneamines have emerged as some of the basic ingredients required for the manufacturing of such products. That chemical industry giants like AkzoNobel Specialty Chemicals are heavily investing in the ethyleneamines market speaks volumes for the future growth prospects for the industry. In 2017 AkzoNobel developed a technological breakthrough in the production of ethyleneamines and derivatives, a technology that has been hailed as a game changer in the ethyleneamines market. The process made it possible to reduce raw material consumption which in turn has contributed towards lowering production costs and improving environmental performance when compared to the current process of ethyleneamines production. Considering the fact that ethyleneamines are potent intermediate chemicals involved in the production of epoxy curing agents that are in high demand in the expanding wind turbine fabrication industry and they also act as additives for oil, road materials, and paper, it is easily explicable why leaders in the chemical industry are interested in increasing their investments in the ethyleneamines market. Key chemical industry players such as Dow Chemical Company, BASF, Huntsman Corporation, Delamine etc. have all made substantial investments in the ethyleneamines industry noting the immense potential held by the business. After the development of the revolutionary procedure for the production of ethyleneamines, recently AkzoNobel started the construction of a prototype plant in Sweden that is meant to demonstrate the more sustainable production procedure of ethyleneamines from ethylene oxide. The facility is being viewed as a further step towards the commercialization of the innovative technology and with the construction underway, AkzoNobel has started to explore options for a world-scale manufacturing facility. The ethyleneamines industry is expected to register increasing demand with the rapid expansion of the pharmaceutical industry as ethyleneamines find immense application as a raw material for the production of antidepressants, antimalarials, antibiotics, antihistamines, local anesthetics and muscle relaxants. The global population is estimated to increase by 1.24% each year until 2030, and 28% of the global population will be aged between 65 to 80 which is a significant rise when compared to approximately 22% in 2000. The aging population will necessarily add to the demand of common medications such as painkillers and prescription drugs like antibiotics, in turn adding momentum to the ethyleneamines market. Besides the pharmaceuticals industry, extensive application of ethyleneamines in the agrochemical industry has added significant impetus to the ethyleneamines market. The expanding population will once again promote the scope for the use of agricultural chemicals which will in turn fuel the ethyleneamines industry as it acts as one of the notable ingredients in pesticides. 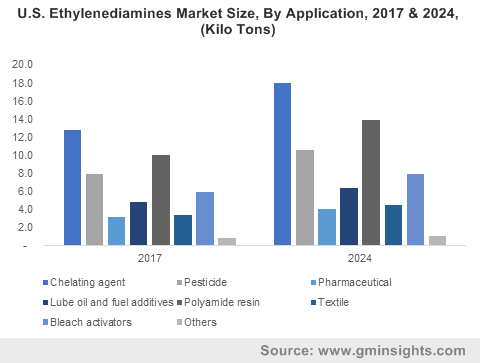 Indeed, ethylenediamines market size from pesticides is anticipated to surpass $290 million by 2024. Ethylenediamines, a sub-product of ethyleneamines, are used in the production of fungicides for the prevention of mildew, scabs, rust and blight in agricultural products. As the population increases, it becomes imperative to improve agricultural production that would help ethyleneamines market to forge new growth avenues. Chelating agents also make for a considerable portion of the ethyleneamines market revenue. The size of the diethylenetriamine market is poised to surpass 10 kilo tons by 2024 solely due to the increasing demand of chelating agents. The expanding size of the paper & pulp industry is expected to act as a driving factor for the chelating agents market. Paper-based packaging materials demand observed in the packaging sector will register growth due to the developments in e-commerce and the increasing demand for door step delivery system of perishable goods, home appliances and other products. The increasing global awareness for the usage of recycled paper products will also have a positive influence on the chelating agents market in the ensuing years. Estimates show that global paper and pulp industry registered more than $500 billion in 2015, a growth rate that is expected to be maintained in the forthcoming years adding impetus to the growth of the chelating agents sector, and inconsequence, impacting the expansion of ethyleneamines market. The application scope of ethyleneamines is immensely humongous, and the product being used as a building block in several industries will eventually contribute towards the growth of the ethyleneamines market. For the record, ethyleneamines industry size is anticipated to surpass $3 billion by 2024. This entry was posted in Bulk & Specialty Chemicals and tagged Asphalt Additives, Bleach Activators, Chelating Agent, Corrosion Inhibitors, Diethylenetriamine, Epoxy Curing Agents, Ethyleneamines Market, Ethyleneamines Market Report, Ethyleneamines Market Research, Ethyleneamines Market Share, Ethylenediamines, Lube And Fuel Additives, Lube Oil And Fuel Additives, Oil Field Chemicals, Paper Wet-Strength Resins, Personal Care, Pesticide, Pharmaceutical, Polyamide Resin, Surfactants, Tetraethylenepentamine, Textile, Triethylenetetramine.